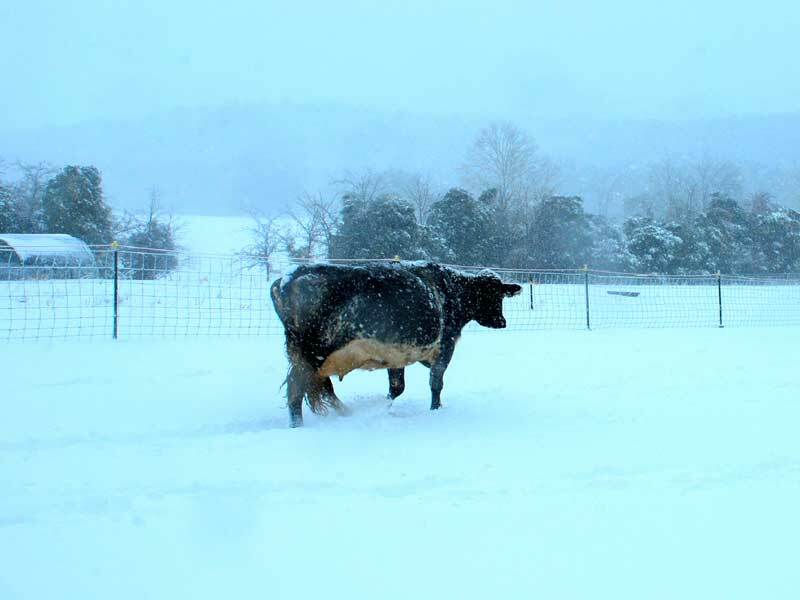 It never, ever fails, somehow whenever there’s historical storm a baby will be born on River Cottage Farm and with a full moon to boot this baby had no choice but to be born in the snow. So after a week overdue, according to our records, baby Michi Storm was born last in the night and is healthy and happy, despite the 9 degree birthing temp. 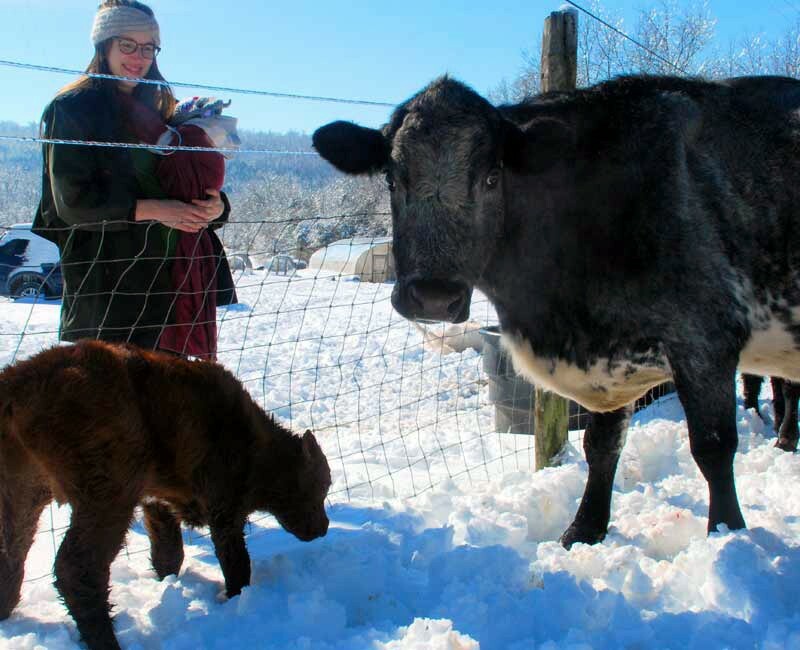 His mom, Dara, is a cow we brought with us from Indiana and we love her dearly. She’s half Dutch Belted (big surprise) and half Milking Shorthorn. Her shape reminds me of one of those old Folk Art pieces where they are shaped like rectangles. Don’t laugh though, back then the stock resembled these painting much closer than our modern cows, sheep and pigs of today. Our goal is to slowly but surely try to revive that hardiness in stock. I remember Gearld Fry speaking to a group of us beginning farmer some 18 years ago explaining why it was so important to choose stock with wide, deep chests. He had us all bend over touching the floor and asked us to take a very deep breath. It’s really hard! He told us that cows without that physical trait can never fully expand their lungs thereby never being able to achieve the full vigor that their ancestors did. 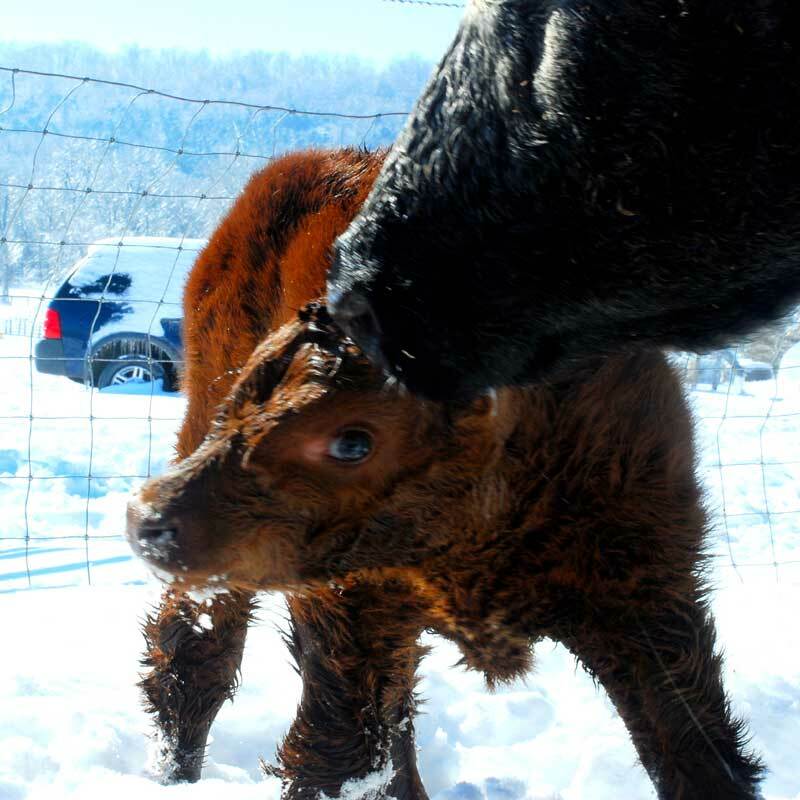 So, all that to explain why, of all the calves, we chose Michi. He already has many of his mom’s traits, minus the color which I would have loved but his legs are short and his chest is deep and wide. Aside from what his Mama gave him it’s really what he will give to his daughters that I am most excited about. According to Gearld, the udder development is passed from the mom to the son to impart along the way. As you can see from this photo, Dara’s udder is perfect! This photo was taken two days before she calved and her udder is FULL but it’s not hanging down to the ground (so no need for trying to breed for longer legs, which is why today’s cows are so much taller) and the weight of the milk is perfectly distributed so no torn ligaments in her future. If all goes well she will give milk well into her late teens. I know that sounds funny but the average cow in the U.S. only lives to be between three and four years of age and many of our cows live and continue to milk through their teens. The oldest cow we have had to give birth on the farm was 18 years old and she gave birth to twins. 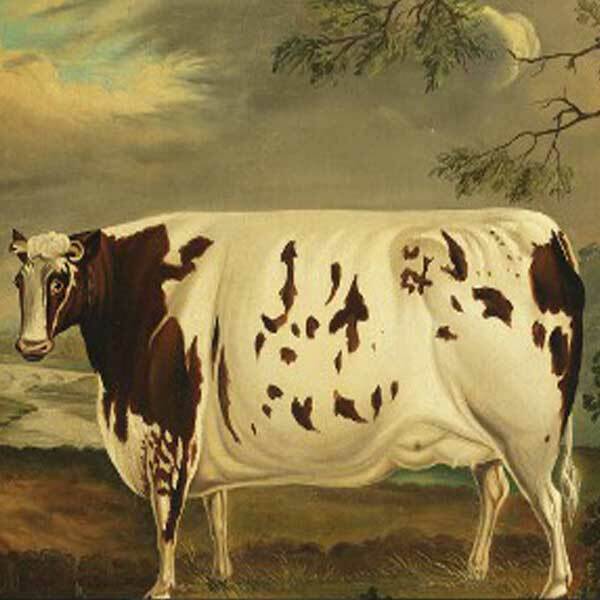 Here is an example of an early 19th century painting of a good old milk cow. Here is a picture of a prize winning dairy cow that is actually taller than the handler and that’s not a kid showing that huge cow. These two Mamas gave birth at River Cottage Farm within a few days of each other and as you can see our cows aren’t heads and shoulders above the average human. Those short legs are what 100% grass fed cows must have in order to be able to maintain their frame without added feed supplementation. This picture shows why cows are being bred to have longer legs, this poor girl can barely walk! Whenever I end an email or a newsletter with “Thanks so much for your amazing support” we really mean it. Without your continued support we could not be working toward bringing back the good old days with the good old cows.